A letter from Shlora Bruth to Herly Mae Wainright dated February 13, 1981. 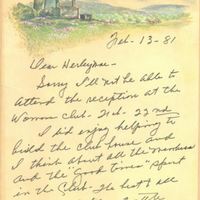 In the letter, Bruth declines an invitation to attend the 75th anniversary celebration of the Oviedo Woman's Club (OWC), which was founded in 1906 as the Oviedo Magazine Club by seven charter members: H. B. McCall, Edith Meade, Georgia Lee Wheeler, Lillian Lee Lawton, Mattie Aulin Wheeler, Milcah Yonge, and Mary King. The first clubhouse was constructed in 1914 and also served as Oviedo's first library. In 1916, the club joined the Florida Federation of Women's Clubs (FFWC) and officially changed its name to the Oviedo Woman's Club. In 1923, the woman's club was federated under the umbrella of the General Federation of Woman's Clubs (GFWC). A new clubhouse was built in 1961 on property donated by R. L. Croom, a former member, which is located at 414 King Street. The Oviedo Woman's Club is involved in many civic projects, including the annual Great Day in the Country Arts and Crafts Festival, the Spring Fundraiser, Tasting Luncheons, and Celebrate Spring Teas. Original letter from Shlora Bruth to Herly Mae Wainright, February 13, 1981: Private Collection of Beatrice Gestrich. 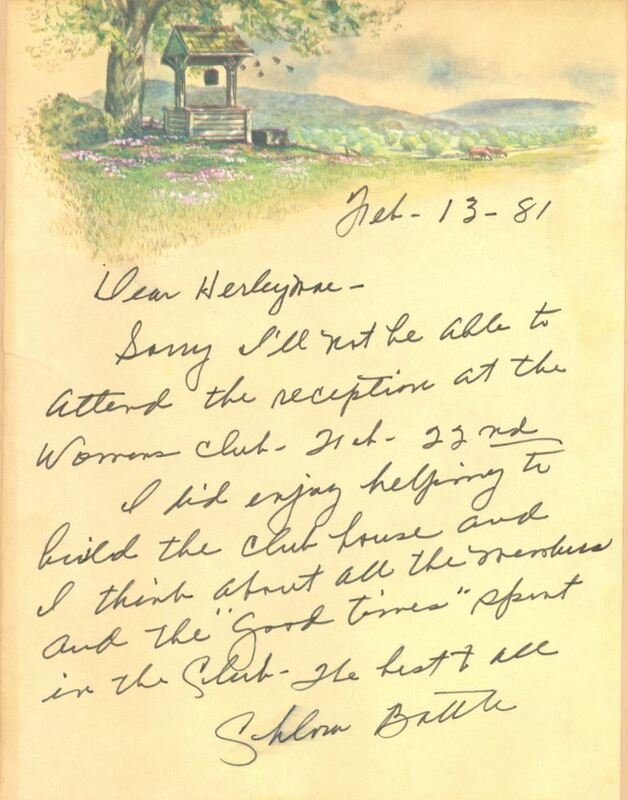 Digital reproduction of original letter from Shlora Bruth to Herly Mae Wainright, February 13, 1981. Originally created by Shlora Bruth. Bruth, Shlora. “Letter from Shlora Bruth to Herly Mae Wainright (February 13, 1981).” RICHES of Central Florida accessed April 23, 2019, https://richesmi.cah.ucf.edu/omeka/items/show/5772.